Dusk is an inspiration in herself & the fact that she finds my blog worthy enough of this honor is the really really greatest compliment my humble blog can ever get! Thanx a bunch once again gorgeous lady........you always have been & always will be an object of admiration and inspiration for me.........mwaah!! Now, as per tradition, I've to share 7 things about myself with you all and give this award to 10 other stylish bloggers.........so, ready....get....set.....& GO!!! 1. I'm not a very Tea or Coffee kind of person. I have both occassionally, specially when out with friends. The only beverage that I have daily in office is hot lemon tea.....that's one brew which I find very refreshing. 3. I'm a self-confessed foodie. Period. 6. I'm terribly scared of Spiders & Snakes!! 1. Prutha of Don't Shoe Me - Ecclectic, bold, fun & fearless! 2. Zarna of Zarna's Runway - This leggy lass is a versatile stunner! 3. Tashrin of Tashrin - She's sweet....she's simple.....and she's stylish. 4. Smrithi of Vintage Obsession - One of the first bloggers I've personally met, this girl's as beautiful inside as she's outside!!! 5. Holly & Sally of Hippie By Heart Thinks Fashion Is Art - These girlies have the most awesome jewelery around! 6. Sonu & Jasleen of Fashion Bombay - Style, poise, talent & a way with words - these fashionistas have got it all! 7. Bonnie of Flashes Of Style - This girl exudes softness, feminity & a lovely sense of style. 8. Ruhi of Republic of Chic - A perfect fashionista! 10. Veronika of Tick Tock Vintage - Her innocence, sweetness & simplicity is reflected in her demeanour. And of course, she carries herself in style....always!! Show your appreciation, acknowledging & linking back to the person who has given you this award. Pass on this award to 10 recently discovered great bloggers (the definition of "recent" is relative). 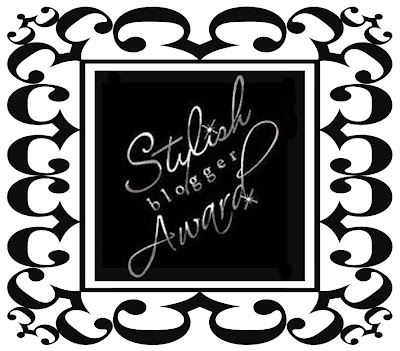 Drop in a line at the chosen blogs letting their stylish owners know that they've been awarded! That's all for now people............hope the wonderful bloggers I passed on the award to will receive it in style! congrats on getting the award! :D you ARE stylish!! congo babes..you totally deserve it .. waiting for your outfit post ..
Congratulations honey for this second award!! !You deserve it!!! I also wanted to come by and and say that I have missed you, finals are keeping me very occupied at the moment, but in 3 days time, I'll be free. @FB: Most welcome girls....you deserve it! thanks so much for thinking of me! you are such a doll. you definitely deserved the award!